Practice is the cornerstone of your team’s success so what if I told you that a jungle tiger can teach you how to improve your practices to ensure more game success? Jungle tigers have to fight for their survival by finding food, hunting for water, warding off predators and constantly staying on guard. Life in the jungle is a constant struggle for survival, so it wouldn’t help tigers to prepare for jungle life by having everything made predictable and easy. The tigers that hunt and protect themselves the best, survive. On the other hand, zoo tigers have it made. Everything they need is provided for them including food, water and safety. They never have to fight off lions in order to eat dinner or crocodiles in order to get a drink of water, and they certainly don’t have to worry about where they’re going to sleep each night. In fact, their life is so predictable and safe that I think we’d all agree it’s got to be pretty boring if you’re a tiger. Where am I going with this? If we took a jungle tiger and put it in a zoo it might be bored but it would survive. But, if we took a zoo tiger and threw it out into the jungle, it wouldn’t last a week. While technically still a tiger, a zoo tiger’s life has become so predictable and taken-care-of that its survival skills have disappeared. While a jungle tiger’s life is harsh, it requires that tiger to use all of its skills all of the time. Yet a zoo tiger’s life is so taken care of for it, that zoo tigers lose their tiger skills and can no longer thrive in the harshness of the jungle. What does any of this have to do with softball? Lots. Softball games represent the jungle. Games are unpredictable, there’s a predator in the other dugout doing their very best to beat you, and nothing is known ahead of time. Yet most of us prepare our teams for the jungle by making our practices more closely resemble a zoo tiger’s life; we make them too predictable (we do lots of the same things in a row), we make them too safe (we only do things our team’s pretty good at doing), and we make them too successful (we do drills until we do them nice and clean). Avoid Predictability – The ability for players to predict what’s going to happen next makes the next thing easier. Practice is typically predictable while games are random. So instead of only hitting ground balls to your infielders when they line up, mix in a line drive, a popup, a softly hit ball. While that might lead to a more difficult drill with more misses, it more closely resembles the randomness that infielders can expect during games. When things become predictable they become less challenging and don’t make you pay as close attention, and these are definitely not habits we want our players to imitate in games. No Re-Dos – Because we want our players to feel confident in their skills we often let our players repeat pitches after a bad one, or get another groundball or pitch after they miss one – but that’s not how things work in a game. The umpire won’t let your pitcher throw another pitch if the last ball walked in a run any more than the batter will hit another ball to the infielder that booted the last ball. Always allowing our players to have another try not only gives our players a false sense of improvement, but it makes it really hard for them to handle the one-and-done type of environment that happen in games. 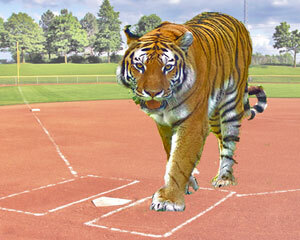 While we think we’re helping players by giving them lots of balls or tosses or pitches in a row, in reality, we’re making them more like a zoo tiger and making it more likely they’ll struggle in the game (the jungle). Junglefy It – While I know that’s not really a word, the concept is to do your best to figure out how to make whatever you’re doing at practice more like that skill in the game/jungle. How can you make your warm-up throws more like the throws your players will make in games? How can you make your soft-toss more like the game, or your groundballs, or outfield drills? If you’re not sure how to do it, then ask your players. Explain the whole jungle tiger-zoo tiger analogy (or just read them this article) and then ask them how they could make their warmup throws more like games? Or their groundball lines? Or their batting practice drills…your players will have some great input if you ask for it honestly and then truly value it. The more you can junglefy your practices the more likely your players will survive and thrive in the game/jungle. I enjoyed the article very much. I typically use survival in the woods or fighting the bear with my teams but the message is exactly the same. Thanks for sharing it! Absolutely great points in general but would have liked to read that repetition is necessary when learning a new skill. Not to be too picky, but Tigers don’t fight Lions as they have not co-habitated since the 1800’s in Central India. Thanks for the info on Tigers not actually fighting lions..good to know. And I’ll be talking about repetition in my next newsletter. It’s role isn’t what you think.